The set up and connections to Split and Unbreakable in Glass work very well, but in the end it is less than expected. 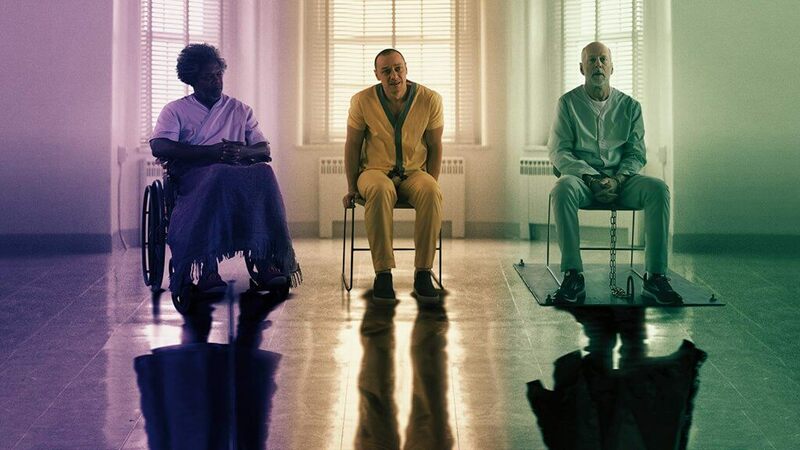 The main three characters David Dunn (Bruce Willis), Elijah Price (Samuel L. Jackson ) and Dennis along with many others (James McAvoy) connect from the Unbreakable in which Dunn is the single survivor of a major train wreck, reach all the way to Glass and past Split to complete a trilogy which raises the question of the reality of the comic book super hero. The story begins with the multiple personality McAvoy capturing a few more cheer leaders, it quickly becomes the story of three super hero characters who are captured and held in an institution for study and control. So Bruce Willis, Sam Jackson and James McAvoy are in the same structure and under study by Dr. Ellie Staple (Sarah Paulson). She has developed a light device that helps control McAvoy’s changing character and uses security personal and cameras to watch the three characters 24 hours each day. The atmosphere in the institution is dark and appears frightening as do the streets from which the three men are captured. The question in Dr Staple’s mind deals with the idea that a super hero from a comic book may not be just entertainment it may be real history. With all that set in motion as expected the three find a simple method of escape and learn of the plot to destroy the Osaka building. As they head out on the street the institute works to keep their existence a secret, but in the days of security cameras and video tape Spencer Treat Clark the loyal son works to foil the secret. Anna Taylor-Joy is young Casey Cooke who survived McAvoy’s many personalities in the past and returns to help him free himself from the multiple frightening characters. It’s difficult to understand her concern for her former captor. Glass is packed with interesting situations, somewhat crazy violence along with an over-the-top set of twists which bring us back to 2000 and Unbreakable. It holds our interest but the climax and ending fizzle. MPAA Rating: Rated PG-13 for violence including some bloody images, thematic elements, and language.